We offer full service design/build landscaping that includes plantings, sprinkler systems, outdoor living spaces which are composed of patios, fire pits and fireplaces, arbors, trellises, and shade structures, landscape and retaining walls, water features both natural and sculptures, boulders, rock gardens and many other amenities too numerous to mention. We enjoy working with our customers to customize a total landscape package to meet your dreams. Our design/build approach keeps budgets and ideas in line during the planning process, although we also offer strictly design-only or build-only services. Working one-on-one with you allows us to design a landscape package to meet your dreams and budget. We listen to you for your ideas and needs and then add our ideas to develop your landscaping. Careful thought is given to provide a plant palette that includes color, texture, layering, and year-around appeal. Each plant type is selected not only for its visual impact but also to meet its cultural needs; sun, shade, wet, dry, etc. Quality plant materials are chosen from local sources so that you start with the best and the hardiest. We pay special attention to low maintenance and wise use of water. 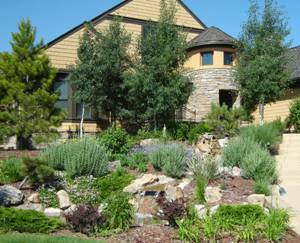 A wonderful attractant for all ages, water features provide an impact to a landscape unlike anything else. Water features can be natural waterfalls and ponds, simple fountains, or elaborate water sculptures. We can do all of these to make each unique to your landscape. They can be tranquil and reflective, crashing water to drown out noise, or anywhere in between. Water lilies and fish can add a special charm and focal point to your landscape. Part of outdoor living spaces, patios provide an outdoor extension of your house or can be sited as a quiet area or ‘getaway’. Materials include flagstone, pavers, concrete colored and textured, or simple crushed stone. Fireplaces, fire pits, and cooking areas are usually a part of these gathering places. Terracing of sloped sites is a good way to create a level play or activity area. This is done by using retaining walls constructed of natural stone or faced concrete or by creating a sloped ‘rock garden’. Providing steps through retaining walls allows for access to special places. Footlights and accent lights, boulders, pots, and sculptures are but a few of the furnishings that add that final touch. Customize a landscape for your lifestyle and introduce items that create atmospheres that reflect your tastes. Since 1989, we have been creating beautiful, creative, and unique award-winning landscapes. We are graduates of Colorado State University and members of Associated Landscape Contractors of Colorado, Home Builder Association, and Parker Chamber of Commerce. Our team regularly attends educational seminars and trade shows to stay on top of the newest and most current materials and techniques. We are multiple Grand Award winners of the Parade of Homes as well as People’s Choice Awards, Best Use of Perennials, and more. We provided the design and installation for the Sunset Magazine Idea House in Douglas County and our courtyard design was featured in Better Homes and Gardens.